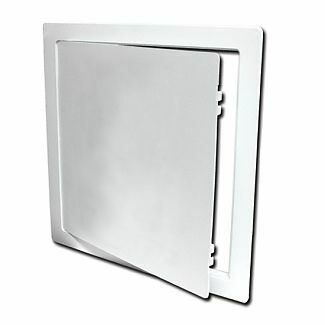 The Handi-Access plastic door is suitable for all surfaces and can be installed easily by applying glue or caulking adhesive to the back of the frame and pressing into place. Door and frames are constructed from 1/8" high impact styrene plastic. 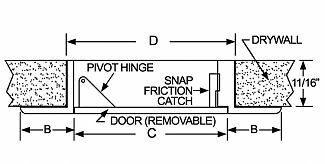 Pivot hinge enables door panel to be removed and held closed with a snap friction catch & opened without special tools. White, lightly textured exposed surface for easy painting. Door Size: 14" x 14". Opening Size: 13-3/4" x 13-3/4".